The Solana Trichomonas Assay is a rapid in vitro diagnostic test for the qualitative detection of nucleic acids isolated from clinician-collected vaginal swab specimens or urine specimens obtained from asymptomatic or symptomatic patients to aid in the diagnosis of Trichomoniasis. The Solana Trichomonas Assay, when performed on the Solana instrument, allows for the rapid, accurate detection of Trichomonas. 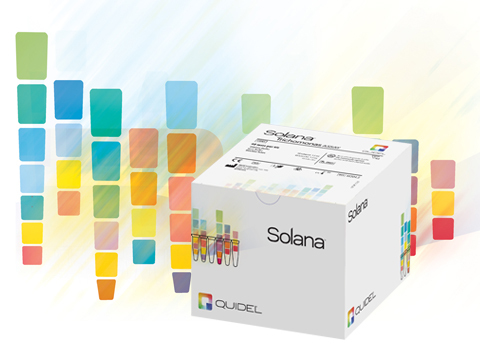 The assay utilizes helicase-dependent amplification (HDA) and fluorescent probe-based detection in the Solana instrument to determine assay results. A vaginal swab specimen or a urine specimen is lysed by simple heat treatment, diluted, and added to a Reaction Tube containing the lyophilized HDA reagents including primers specific for the amplification of a T. vaginalis-specific target sequence, as well as sequence specific probes. Competitive process control (PRC) is included in the Lysis Tube to monitor sample processing, inhibitory substances in clinical samples, reagent failure or instrument failure. Results are displayed on the touchscreen, can be saved to the instrument, printed, and are capable of being sent to the LIS and exported through one of Solana’s five USB ports. Solana Trichomonas is supported by the power of Virena®.